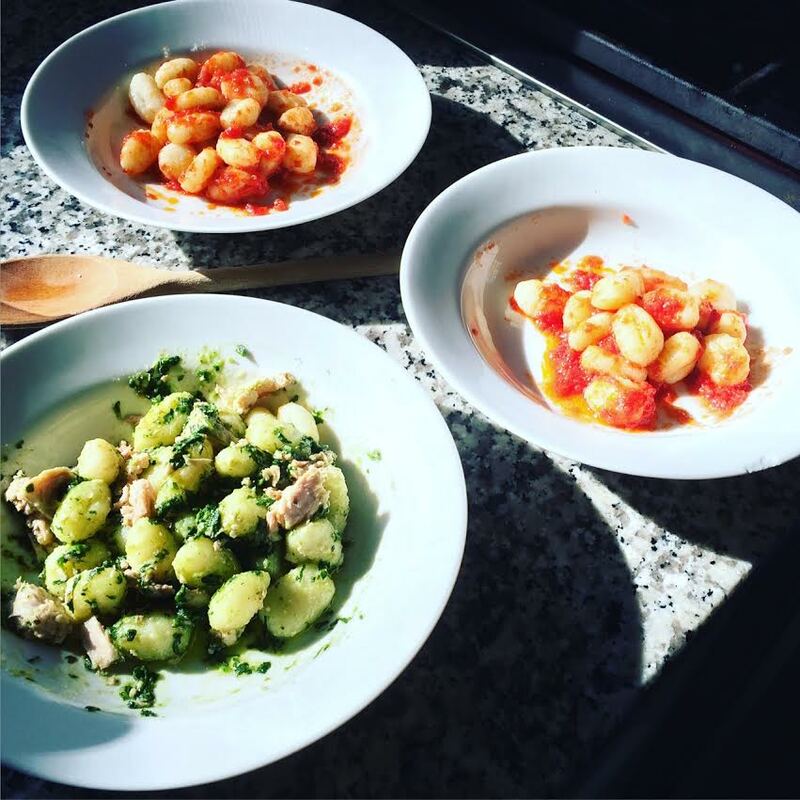 Gnocchi with Pesto and Canned Italian Tuna – of course we had to make a second dish with tomato sauce as well. When researching our recipe for Gnocchi with pesto and canned Italian tuna we kept seeing recipes that focused on baking the ingredients and our immediate reply was why would you bake your Gnocchi with pesto and tuna dish? Our dish focuses on high quality Italian tuna packed in olive oil and homemade pesto and our view is that adding unnecessary heat to these two ingredients will degrade the flavor of the pasta dish. Assembling the Gnocchi with Pesto and Tuna is fairly straightforward and we recommend either making a fresh batch of gnocchi from scratch (see our recipe) or buying a high quality version from your local Italian market. 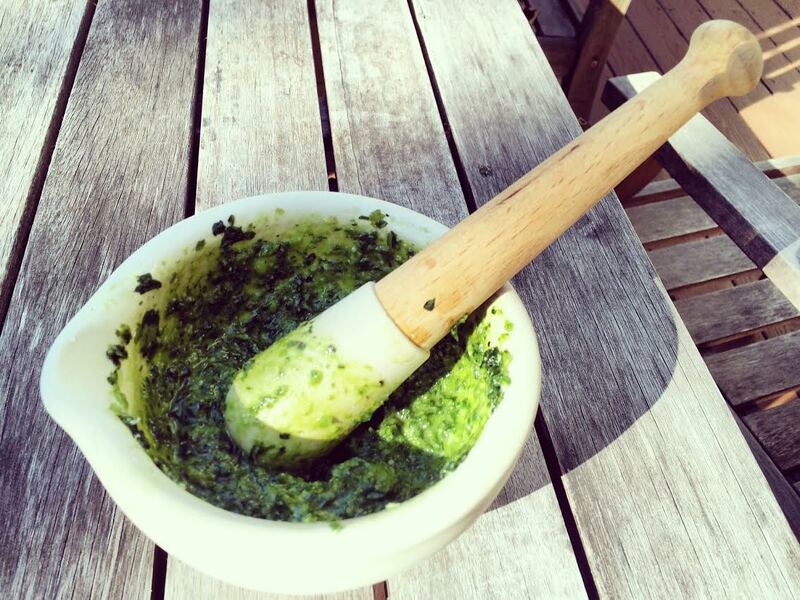 Next, whip up a batch of fresh pesto (again see our recipe). You could of course find plenty of already prepared pesto sauces but like bottled tomato sauce why not make a better product yourself? The next step includes buying a can or two of high quality tuna packed in olive oil (we like As Do Mar or Flott). In a large bowl combine the flaked tuna (with all of olive oil contained in the can) with the room temperature pesto sauce. Add your cooked gnocchi and combine gently. At this point, add a healthy amount of grated Parmigiano-Reggiano and some fresh extra virgin olive oil. Add Kosher salt and freshly ground black pepper, if necessary. In a large bowl combine the ingredients gently. Add cheese at the end and mix gently one more time. No heating or baking required. Homemade pesto sauce to go with the Gnocchi – make the pesto by hand for a better consistency and taste.